With five thousand new viruses and malware being created everyday, no one anti-virus can catch them all. So it’s a good idea to use more than one. You can always have more than one anti-spyware, but having more than one anti-virus may cause problems since they’ll conflict with each other. 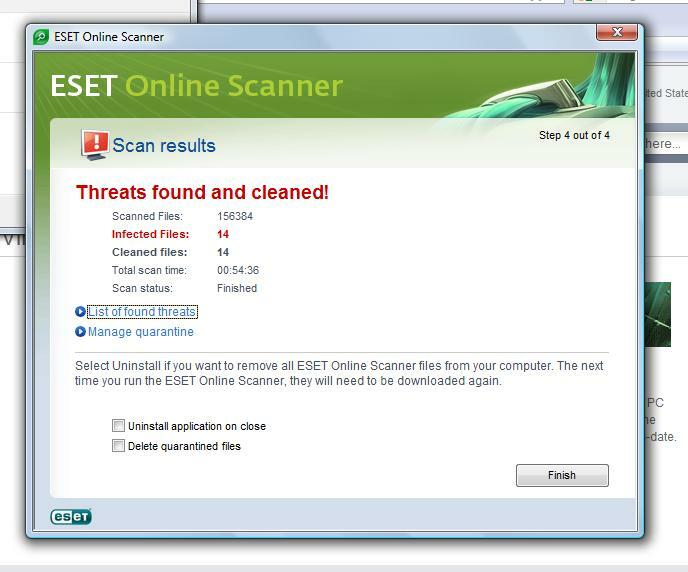 I recommend using online scanners to supplement your regular anti-virus instead. 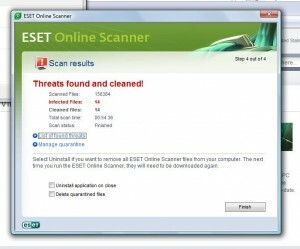 Eset Online Scanner is both excellent and free. Click here to download Eset. It will take you to Ducktoes Calgary Computer Repair’s Spyware and Virus Removal page. We Miss Free AVG 7.5! Ms. Ducktoes, like most other computer techs, has always loved AVG by Grisoft. Grisoft has given free anti-virus to home users and, unlike most other free anti-virus applications, AVG Free included an automated update and scan that was reliable, efficient, and effective. AVG was too good to be true. Or to last. Other techs and I happily uninstalled scores of the bloated Norton and McCaffee programs and switched our clients to the free AVG. Our clients, now with much faster computers, were ecstatic. Yet on May 31, AVG 7.5 breathed its last breaths. We all had to switch to 8.0. But the new AVG 8 has a few kinks. One, it doesn’t update or run automatically, at least not reliably, and, two, seems to be trying to be all things to all people and uses up too many resources. Itâ€™s going the way of Norton. I don’t blame Grisoft. They see Norton–a fat lazy slob of an anti-virus program–getting most of the business, cornering the market, and so they abandon their market niche of small but effective to go after the big bucks. In their shoes, I might do the same. Free donâ€™t pay the bills, honey. Also malware is getting bad–the spyware especially. Some really pernicious bugs are being downloaded from e-mail, so adding anti-spyware and an e-mail scanner might be considered a good idea. Yet still, a little education about e-mail and a separate anti-spyware, AVG’s anti-spy is not the best, and you’ll have to have another one anyway. I recommend Spyware Doctor, e-mail me to buy it) makes more sense than the toll AVG takes on speed. However, I do understand where theyâ€™re coming from. Yet, even though I sympathize with Grisoft, many clients are calling me to fix their AVG. Somewhere in the updating process from 7.5 to 8.0, the clients get lost. The free version is hard to find, and they are worried it doesn’t give them enough protection. So I install it for them. But even so, it doesn’t seem to work well. My husband, who is conscientious computer user in that he habitually updates and runs all his anti-virus and anti-spyware, doesn’t have a problem. He just runs AVG manually. But many of my clients can’t seem to manage it. In fact, I’ve gotten several new clients from the switch to AVG 8.0. Also the new AVG uses up a lot of resources. On my teenage son’s computer, the AVG processes use up more than 100,030 . That’s more than any other running process. AVGâ€™s become a resource hog, just like Norton or McCaffee. On newer, more powerful computers, this may be fine, but on a lot of older, slower computers, it’s too much. So now I find myself uninstalling AVG and looking around for something else. What I wish for is a free AVG that was like the old one, just anti-virus with a scheduler and automatic updater. But in the meantime I’m researching. But use AVG 8.0 if you can. AVG’s not a problem for newer, larger computers, and it’s too risky to go without protection for the sake of speed.